Open your medicine cabinet and use a ruler to measure the door’s width. Grab your scissors and cut a length of magnetic strip that is at least one inch shorter than the width of the cabinet door. Cut a strip of scrapbook paper that is about a half-inch longer and wider than the magnetic strip. Cover the front of the magnetic strip with the piece of scrapbook paper. Fold over any excess paper and press it into the adhesive backing of the magnetic strip to keep it in place. Use the foam mounting squares to mount your magnetic strip to the back of the cabinet door. 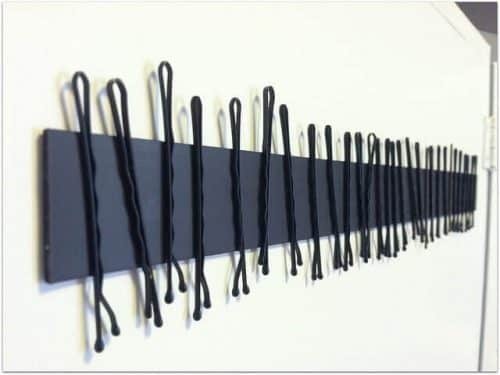 Add your bobby pins and enjoy never losing another one again!